Interval International has announced the addition of The Bliss Jungle Riviera Maya in Mexico. This property joins Grupo Vidanta’s The Grand Bliss Riviera Maya, The Bliss Nuevo Vallarta, and Grand Luxxe Residence Club that are currently part of Interval’s global network. 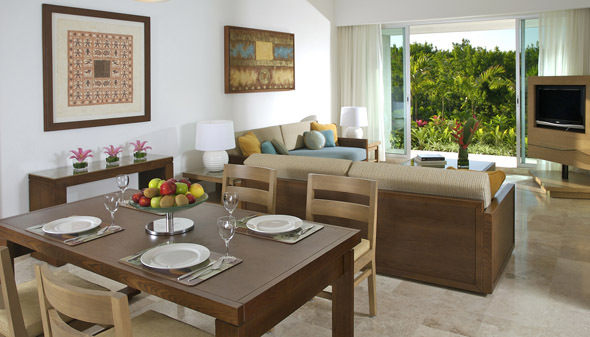 Grupo Vidanta is a leading development company known for its high-caliber hotels and resorts. “We strive to make every vacation an extraordinary experience for our members and guests. Through our membership program, visitors can stay in spacious world-class accommodations, and create lasting memories with their families,” said Michel Beuffe, CEO of Grupo Vidanta. The Bliss Jungle Riviera Maya is close to the town of Playa del Carmen, well known for its pedestrian walkway, sidewalk cafes, and bustling nightlife. The property has 60 units that feature living rooms, kitchens and dining areas, premium bedding, ceiling fans, 40-inch LCD TVs, complimentary Wi-Fi, and daily turndown service. Guests at the resort have access to upscale amenities and services available on-site and at the adjacent Grupo Vidanta resorts. These include a variety of eateries, from fine dining to casual buffets, several bars and lounges, sprawling pool areas, kid’s club, a full-service spa and fitness center, and a par-54, Jack Nicklaus-designed 18-hole golf course and pro shop. New purchasers at these properties will be enrolled as individual members of Interval International, entitling them to a host of year-round benefits, including the opportunity to exchange their weeks for stays at other resorts in Interval’s global network.